Aug 13, 1998 - AND JONATHAN LEIS1*. Department of Biochemistry ...... Weir, H. M., P. J. Kraulis, C. S. Hill, A. R. Raine, E. D. Laue, and J. O.. Thomas. 1993. Jun 1, 2005 - lonidamine, arsenite and CD437. Oncogene 20:7579â7587. 8. Boya, P., A. L. Pauleau, D. Poncet, R. A. Gonzalez-Polo, N. Zamzami, and G.
Jun 1, 2005 - suggesting a direct cooperative link between apoptosis and the proteins that regulate the DNA damage response. ... ogy & Immunology, Fairchild Science Building, 299 Campus Dr., Stan- ... DNASTAR Protean 5.03 sequence analysis software. Dec 23, 2015 - 60 FS4 (Merck), CHC1,-CH,0H-NH40H-&0 (70100:15:25), R, = 0.55. FAB(-)MS (50%G/") m / z 689 (loo%, (M-HI-) (expected 689). 'H-NMR (400. Aug 26, 2015 - novel viral protein expressed from the PB2 segment of influenza A virus. ...... to the mitochondrial antiviral signaling protein (MAVS) (43, 45). Apr 23, 2009 - provided by Ervin Fodor (16). ...... We thank Ervin Fodor, Ron Fouchier, Mark Krystal, Laurence .... Gonzalez, S., T. Zurcher, and J. Ortin. 1996. Apr 6, 2006 - Sciences, National University of Singapore, 14 Science Drive 4, Singa- ..... Read, L. M. Rice, T. Simonson, and G. L. Warren. 1998. Feb 28, 2002 - Images were processed and prepared for presentation by using Photoshop and Illustrator software. (Adobe Systems, San Jose, Calif.). Feb 28, 2002 - ology and Molecular Genetics, Harvard Medical School, 200 Long- wood Ave., Boston, MA ... ular factories, does not cause increased MT stability or bun- dling. ...... 109:76â86. 15. Heath, C. M., M. Windsor, and T. Wileman. Jul 29, 2009 - activities occur. MATERIALS AND METHODS. Cells, viruses .... Photoshop and Illustrator (Adobe Systems). Core immunoprecipitation assay. induced in EBV-negative cell lines by expression of the EBV latent infection membrane protein-1 ... Epstein-Barr virus (EBV) causes infectious mononucleosis. Aug 2, 1999 - CHO cells were maintained in glutamine-free Glasgow's modified ...... help with this project: Mary Norval and Hugh Miller, Edinburgh Uni-. A. C. F. Perry, R. Jones and L. Hall database searches reveal a further, unpublished member of the. MDC family (EMBL accession number Z21961), identified in. the left end of the viral genome containing ... al 5' end sequences were covalently linked to the. 845 ...... Wei, C. M., M. Gibson, P. G. Spear, and E. M. Scolnick. 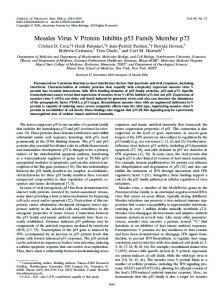 JOURNAL OF VIROLOGY, Feb. 2004, p. 1992–2005 0022-538X/04/$08.00⫹0 DOI: 10.1128/JVI.78.4.1992–2005.2004 Copyright © 2004, American Society for Microbiology. All Rights Reserved. Temperature-sensitive (ts) mutants of vaccinia virus defective in the B1 kinase demonstrate a conditionally lethal defect in DNA synthesis. B1 is the prototypic member of a new family of protein kinases (vaccinia virus-related kinases, or VRK) that possess distinctive B1-like sequence features within their catalytic motifs (R. J. Nichols and P. Traktman, J. Biol. Chem., in press). Given the striking sequence similarity between B1 and the VRK enzymes, we proposed that they might share overlapping substrate specificity. We therefore sought to determine whether the human and mouse VRK1 enzymes (hVRK1 and mVRK1, respectively) could complement a B1 deficiency in vivo. Recombinant ts2 viruses expressing hVRK1, mVRK1, or wild-type B1 were able to synthesize viral DNA at high temperature, but those expressing the more distantly related human casein kinase 1␣2 could not. Complementation required the enzymatic activity of hVRK1, since a catalytically inactive allele of hVRK1 was unable to confer a temperature-insensitive phenotype. Interestingly, rescue of viral DNA synthesis was not coupled to the ability to phosphorylate H5, the only virus-encoded protein shown to be a B1 substrate in vivo. Expression of hVRK1 during nonpermissive ts2 infections restored virus production and plaque formation, whereas expression of mVRK1 resulted in an intermediate level of rescue. Taken together, these observations indicate that enzymatically active cellular VRK1 kinases can perform the function(s) of B1 required for genome replication, most likely due to overlapping specificity for cellular and/or viral substrates. J. VIROL. and 12 hpi) by scraping, collected by centrifugation, washed once with PBS, and resuspended in 500 ␮l of loading buffer (10⫻ SSC [1⫻ SSC is 0.15 M NaCl plus 0.015 M sodium citrate, pH 7.0], 1 M ammonium acetate). The cells were disrupted by three cycles of freeze-thawing. After vortexing, 25 ␮l of each sample was spotted in duplicate onto a ZetaProbe blotting membrane (Bio-Rad) with the Bio-Dot microfiltration dot blot apparatus (Bio-Rad). DNA was denatured in situ with 0.5 M NaOH and 1.5 M NaCl for 10 min and washed twice with 10⫻ SSC for 5 min. The membrane was air-dried, and viral DNA was detected by hybridization with a radiolabeled nick-translated probe representing the HindIII E and F fragments of the vaccinia virus genome. Data were analyzed on a phosphorimager. Immunodetection analyses of viral proteins. 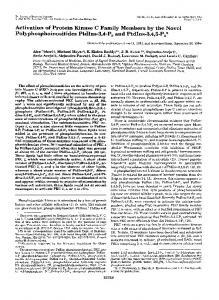 Rabbit polyclonal antiserum directed towards E9 (25), A20 (18), D5 (11), I3 (35), H5 (8; U. Sankar and P. Traktman, unpublished data), A17 (45), A14 (45), L4 (22), and F18 (22) have all been developed and described by our laboratory. Cell lysates were fractionated by SDS-polyacrylamide gel electrophoresis (PAGE), transferred electrophoretically to nitrocellulose, and incubated with primary and secondary antibodies as originally described. Blots were developed with colorimetric or chemiluminescent reagents. 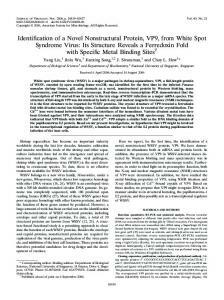 Determination of 24-h virus yield. Confluent 35-mm-diameter dishes of BSC40 cells were infected at an MOI of 2 and maintained at 31.5 or 39.7°C. Cells were harvested at 24 hpi, collected by centrifugation, and resuspended in 1 mM Tris (pH 9.0). The cells were disrupted by three cycles of freeze-thawing and two 15-s bursts of sonication. Virus yields were assessed by titer determination on BSC40 cells at 31.5°C. Three separate experiments were performed, and the titers of each were determined in duplicate. A ratio was calculated [(PFU obtained at 39.7°C)/(PFU obtained at 31.5°C)] for each virus, and the results were graphed as percentages, with standard errors indicated. Immunoprecipitation of H5 after metabolic labeling with 32PPi. Confluent 35-mm-diameter dishes of BSC40 cells were infected at an MOI of 15 and maintained at 39.7°C. At 3 hpi, cells were incubated with warmed phosphate-free DMEM (ICN Biomedicals Inc, Costa Mesa, Calif.) supplemented with L-glutamine and 100 ␮Ci of 32PPi per ml. After 2 h of metabolic labeling, cells were harvested, rinsed once with PBS, and lysed in 1⫻ PLB (0.1 M NaPO4 [pH 7.4], 0.1 M NaCl, 1% Triton X-100, 0.1% SDS, 0.5% sodium deoxycholate [1.2 ml per 3 ⫻ 106 cells]) containing 1 mM sodium orthovanadate. Clarified lysates were incubated with primary anti-H5 serum (8; Sankar and Traktman, unpublished) for 4 h followed by incubation with protein A-Sepharose (Sigma) for 1.5 h with end-over-end mixing; immunoprecipitates were then retrieved, washed extensively, and analyzed by SDS-PAGE and autoradiography. 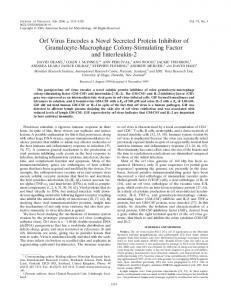 Proteolytic processing of virion proteins. Confluent 35-mm-diameter dishes of BSC40 cells were infected with wt, ts2, ts2/hVRK1, or ts2/mVRK1⌬⌬ at an MOI of 2 and maintained at 31.5 or 39.7°C. As a control, cells were infected with wt virus in the presence of 100 ␮g of rifampin per ml. At 7 hpi, the cells were rinsed with warmed methionine-free DMEM and incubated for 60 min with warmed methionine-free DMEM supplemented with 100 ␮Ci of [35S]methionine per ml. The cells were either placed on ice and harvested immediately (pulse) or subjected to a 5-h chase protocol in which the medium was aspirated, and cells were rinsed and fed with warmed DMEM supplemented with 5% FCS and maintained at the original temperature until 12 hpi. The cells were scraped, collected by centrifugation, resuspended in PBS, and lysed with SDS sample buffer. Proteins were resolved by electrophoresis on an SDS–10% acrylamide gel and visualized by autoradiography on Kodak MR film. Preparation of digital figures. Sequences were retrieved from GenBank and aligned by the Clustal V method and Lasergene software (DNASTAR Inc., Madison, Wis.). Original data were scanned on a SAPHIR scanner (LinotypeHell Co., Hauppauge, N.Y.) and were adjusted with Photoshop software (Adobe Systems Inc., San Jose, Calif.). Data from the dot blot hybridization were acquired on a Storm PhosphorImager (Molecular Dynamics, Sunnyvale, Calif.) and quantitated with ImageQuant software (Molecular Dynamics). Graphs were plotted with SigmaPlot (SPSS Science, Chicago, Ill.). Plaque assays were photographed with an AlphaImager documentation system (Alpha Innotech, San Leandro, Calif.). Final figures were assembled and labeled with Canvas software (Deneba Systems, Miami, Fla.). FIG. 1. Alignment of B1 kinase with human and mouse VRK1s: conservation of distinctive catalytic motifs throughout the family. Predicted amino acid sequences for vaccinia virus (vv) B1 (Western Reserve strain, nucleotide database entry J05178), hVRK1 (NP_003375), mVRK1 (NP_035835) and its splice variants mVRK1⌬ and mVRK1⌬⌬ (29a), and hCK1␣ (P48729) were aligned by the Clustal V method within the MegAlign program of DNAStar (Lasergene, Inc.). Residues shown in white type within black boxes indicate those that are found in vvB1 and are shared by the majority of the VRK sequences. Essential conserved domains with known catalytic functions are noted with boxes above the relevant sequences: the Walker A and Walker B bipartite ATP binding domains, the catalytic loop (VI), active site (VII), and substrate recognition (VIII) domains. The Gly residues altered in ts2 and ts25 (gray circles) are conserved in all VRK1 sequences. A vertical line marks the C terminus of the 300-amino-acid vvB1 sequence and highlights the presence of C-terminal extensions of 60 to 120 amino acids in the mammalian VRK1 proteins. The putative NLS found within the hVRK1 and mVRK1 sequences is also marked. mVRK1 sequences that are absent in the alternatively spliced mVRK1⌬ (missing exon 12) and mVRK1⌬⌬ (missing exons 12 and 13) variants are also noted. Because B1 and the VRK1 families have been placed within the CK1 superfamily, hCK1␣ is included in the alignment. Although key portions of the catalytic domains are retained in hCK1␣, there is much less overall homology, and several of the distinguishing sequence variants found in B1 and the VRK1 proteins are absent in hCK1␣. function. We therefore generated a panel of ts2 recombinants expressing h- or mVRK1, wt B1, or CK1␣ from within the nonessential TK locus. Generation of ts2 viruses expressing the various mammalian kinases. cDNA inserts encoding C-terminally MYC-tagged hVRK1, mVRK1, mVRK1⌬, mVRK1⌬⌬, or wt B1 or N-terminally HA-tagged hCK1␣ were generated and inserted into the transfer vector pGS53. In these constructs, the genes are placed under the regulation of the constitutive viral p7.5 promoter and are flanked by the left and right halves of the viral TK gene. By performing infections and transfections at permissive temperature and selecting for TK⫺ viruses, we were able to isolate a panel of recombinant viruses in which each of these genes had been individually inserted into the TK locus. A summary of the viruses generated and their predicted genotypes is diagramed in Fig. 2. In each case, retention of the ts2 lesion in the endogenous B1 gene was confirmed by sequence analysis (data not shown). To verify that the mammalian proteins were indeed being stably expressed during infections with these viruses, lysates were prepared from BSC40 cells infected at 31.5°C with the various recombinants and subjected to SDSPAGE and immunoblot analysis. As shown in Fig. 3, infection with each of the recombinant viruses did lead to the expression of the appropriate VRK1, CK, or B1 proteins, as detected by either antigen-specific (anti-B1, anti-hVRK1, or anti-mVRK1) or epitope-specific (anti-MYC or anti-HA) antibodies. In this experiment, the endogenous VRK1 proteins are not evident in the immunoblot analysis, and the B1 proteins expressed from the endogenous loci are also below the limits of detection. The anti-hVRK1 antibody shows some cross-reactivity with the mVRK1 protein, due to the high degree of conservation between these proteins. The mVRK1 antibody does not crossreact with hVRK1, since much of the immunogen was derived from exon 12 and 13 sequences which have no cognates in hVRK1. The anti-mVRK1 serum, however, recognizes two additional proteins, one of cellular (square) and one of viral (circle) origin. Viral DNA synthesis is rescued by expression of the VRK1s but not hCK1␣. Since DNA replication is compromised during nonpermissive infections with the ts B1 mutants, the first question we addressed was whether expression of the mammalian kinases could restore DNA synthesis at 39.7°C. BSC40 cells were infected at 31.5 or 39.7°C with wt virus, ts2, or the ts2 recombinant viruses. At 3, 4.5, 6, 7.5, 9, and 12 hpi, cultures were harvested and the levels of viral DNA were quantitated by Southern dot blot analysis. The experiment was performed in triplicate, and each result was spotted in duplicate. The data shown in Fig. 4 are from a representative experiment. Figure 4A illustrates the accumulation of DNA during infections performed with wt virus, ts2, ts2/B1, and ts2/hCK1␣ at 31.5 and 39.7°C. In all the infections performed at 31.5°C, the profiles of viral DNA synthesis were similar, with the accumulation of DNA being detected as early as 6 hpi. However, dramatic differences were observed for the infections performed at 39.7°C. During wt infections performed at 39.7°C, viral DNA began to accumulate earlier (4.5 hpi) and reached higher levels than had been seen at 31.5°C. In contrast, cells infected with ts2 at 39.7°C exhibited a reproducible 3-h delay in viral DNA accumulation. DNA accumulation was not detected until 7.5 hpi and never reached the levels observed during wt infections. FIG. 2. Schematic representation of the genotypes of the ts2 recombinants containing ectopic kinase alleles. wt vaccinia virus (WR strain) was used as a reference for the phenotypic analysis, since it encodes wt B1. In the ts2 virus, the lesion resulting in the ts phenotype (GAT3GGT) is designated by an X within the B1 gene (open box). The hVRK1, mVRK1 (and the ⌬ and ⌬⌬ variants), wt B1, and hCK1␣2 ORFs were placed under the control of the constitutive p7.5 promoter and inserted into the nonessential TK locus of the ts2 genome. hVRK1, mVRK1s, and wt B1 were epitope tagged with Cterminal c-MYC tags (EQKLISEEDL), whereas an HA tag (YPYDVPDYA) was fused to the N terminus of hCK1␣. FIG. 3. hVRK1, mVRK1s, hCK1␣, and wt B1 are expressed during infections performed with the ts 2 recombinant viruses. BSC40 cells were either left uninfected (lane 1) or infected with wt virus (lane 2), ts2 (lane 3), ts2/B1 (lane 4), ts2/hCK1␣ (lane 5), ts2/hVRK1 (lane 6), ts2/mVRK1 (lane 7), ts2/mVRK1⌬ (lane 8), or ts2/mVRK1⌬⌬ (lane 9) at 31.5°C for 17 h (MOI of 10). Cell lysates were subjected to immunoblot analysis with antisera directed against hVRK1, mVRK1, B1, HA, or c-MYC followed by incubation with an HRP-conjugated secondary antibody and chemiluminescent development. In the hVRK1 panel, a strong signal was seen in cells infected with the ts2/hVRK1 recombinant; in addition, the sera show a moderate level of crossreactivity with the mVRK1 proteins but do not detect endogenous hVRK1 levels. Two cross-reactive proteins (one viral, 䡬, and one cellular, e) are seen in the mVRK1 panel. For the blot developed with anti-B1 serum, endogenous levels of B1 are not detected, but the B1 protein overexpressed in the ts2/B1 recombinant is easily seen. FIG. 4. Expression of the mammalian VRK1s, but not hCK1␣, rescues the ts2 DNA synthesis defect. Confluent monolayers of BSC40 cells were infected with wt virus, ts2, or the panel of ts2 recombinant viruses (MOI of 2) and maintained at 31.5 or 39.7°C. Individual cultures were harvested at 3, 4.5, 6, 7.5, 9, or 12 hpi, and the levels of accumulated viral DNA were determined by dot blot hybridization, which was performed in duplicate. Data were acquired on a Storm Phosphoimager, quantified with Image-Quant software, and graphed with SigmaPlot software. Panel A presents the data obtained for cells infected with wt virus, ts2, ts2/B1, and ts2/hCK1␣ at either the permissive (31.5°C) or nonpermissive (39.7°C) temperature. Panel B presents the data obtained for cells infected with wt virus, ts2, ts2/mVRK1, ts2/mVRK1⌬, ts2/mVRK1⌬⌬, and ts2/hVRK1 at either permissive (31.5°C) or nonpermissive (39.7°C) temperature. The asterisks emphasize that the 6- and 7.5-h time points demonstrate the maximal difference in DNA accumulation between wt and ts2 infections and, hence, represent the most informative point at which to judge whether expression of the ectopic kinase genes inserted into the recombinants rescues the replication defect. Note the different scales used for the ordinates in the four panels. FIG. 6. Biological complementation by VRK1: analysis of 24-h virus yield. Confluent 35-mm-diameter dishes of BSC40 cells were infected with wt virus, ts2, or the panel of ts2 recombinant viruses (MOI of 2) and incubated for 24 h at either 31.5 or 39.7°C. Cells were harvested and disrupted, and the virus yield was quantitated by titration on BSC40 cells at 31.5°C. Three separate experiments were performed, and each was titrated in duplicate. The percent of virus yield obtained at 39.7°C relative to that obtained at 31.5°C was calculated; the average values were plotted with the standard errors shown. FIG. 5. Does the ts2 defect or its rescue affect the accumulation or phosphorylation of viral replication factors? 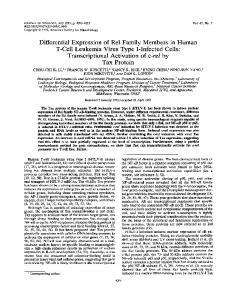 (A) Levels of replication proteins are not affected by the presence or absence of active B1. Confluent monolayers of BSC40 cells were infected with wt virus (lane 1), ts2 (lane 2), ts2/hVRK1 (lane 3), or ts2/B1 (lane 4) (MOI of 15) and incubated at 39.7°C for 4 h prior to harvesting. Cell lysates were fractionated on SDS–12% polyacrylamide gels, and proteins were transferred to nitrocellulose filters, which were cut appropriately and probed with antibodies directed against E9, A20, D5, H5, or I3. After incubation with HRP-conjugated secondary antisera, immunoreactive proteins were visualized either by colorimetric (H5 and I3) or chemiluminescent (E9, A20, and D5) development. Equivalent levels of all five proteins are seen in the four samples; note, however, that the H5 protein seen in lanes 1 and 4 is heterogeneous, containing additional species with reduced mobility. (B) Immunoprecipitation of 32P-labeled H5 protein: H5 hyperphosphorylation is B1 dependent and is not required for the rescue of DNA replication. Confluent 35-mm-diameter dishes of BSC40 cells were infected with wt virus (lane 5), ts2 (lane 6), ts2/hVRK1 (lane 7), or ts2/B1 (lane 8) (MOI of 15) and incubated at 39.7°C for 3 h. Cells were then incubated in phosphate-free medium supplemented with 100 ␮Ci of 32PPi per ml at 39.7°C for 2 h prior to harvesting. Radiolabeled cell lysates were immunoprecipitated with anti-H5 serum, and immunocomplexes were fractionated on an SDS– 12% polyacrylamide gel and visualized by autoradiography. FIG. 7. Plaque formation of ts2 at 39.7°C is restored by the expression of hVRK1, mVRK1, and wt B1, but not hCK1␣. Confluent 35-mmdiameter dishes of BSC40 cells were infected with 200 PFU of the viruses indicated/plate and incubated at either 31.5 or 39.7°C for 2 days. Cells were then fixed and stained with 3.7% formaldehyde–0.1% crystal violet to visualize the viral plaques. FIG. 8. Complementation activity of hVRK1 requires catalytic activity. A similar experiment to that described for Fig. 6 was performed with wt virus, ts2, ts2/hVRK1, and ts2/hVRK1K71A, D197G. Cells were infected at an MOI of 2 for 24 h at both 31.5 and 39.7°C. The percentage of virus produced at high versus low temperature is shown graphically; the immunoblot shown below the graph (developed with anti-hVRK1) confirms that both the wt hVRK1 and the catalytically inert mutant were expressed in the appropriate infections. nases. Either the VRK1s are fortuitously able to phosphorylate virus-encoded protein(s) that function in DNA replication and/or the later stages of the virus replication cycle or both B1 and the VRK1s recognize and phosphorylate cellular proteins which participate in these processes. To date, we have not shown that any of the repertoire of viral proteins involved in viral DNA synthesis are substrates for B1 phosphorylation. An expanded search for relevant B1 substrates is therefore an area of importance for future studies. The VRK1 proteins show robust autophosphorylation activity, unlike the B1 kinase (29a and data not shown). Using heat-killed extracts prepared from either uninfected or vaccinia-infected BSC40 cells as a source of substrates for in vitro kinase assays, B1 and hVRK1 do share the ability to phosphorylate several common cellular and viral proteins (Boyle and Traktman, unpublished). There have also been reports that hVRK1 can phosphorylate fragments of murine p53 (1, 23); however, the functional role of this modification remains to be determined. While we have been unable to confirm the phosphorylation of intact p53 by hVRK1, p53 does indeed appear to be a B1 substrate in vitro (Boyle and Traktman, unpublished). Further analysis of whether VRK1 or B1 intersect with the p53 pathway in vivo and what roles these kinases play in DNA replication or repair deserves attention. Genetic data from other organisms suggest that such a role for VRK1 is quite possible. In C. elegans, RNA interference-mediated depletion of a VRK1-related kinase (WormBase ID F28B12.3) causes embryonic lethality characterized by a number of defects in cell division (http://rnai.org). Indeed, this functional relatedness is conserved across species, since a recombinant ts2 virus ectopically expressing a D. melanogaster VRK homolog (gene CG6386, also known as BcDNA: LD09009) can form plaques and produce a robust 24-h virus yield at 39.7°C (data not shown). In Saccharomyces cerevisiae, mutation of the gene encoding the most closely related protein kinase (Hrr25) leads to increased sensitivity to HO endonuclease and methyl methanesulfonate as a result of diminished repair (16). It is worth noting that B1 is highly conserved among all members of the Poxvirus family, except Molluscum contagiosum virus (MCV), from which it is conspicuously absent (36, 37). This is particularly intriguing in light of MCV’s restricted host range and its inability to replicate in tissue culture. It will be worth addressing the question of whether the absence of B1 plays a role in restricting MCV replication to human keratinocytes and whether the availability of VRK1 in this particular cell population might render them supportive of infection. ACKNOWLEDGMENTS This work was funded by the following grants from the NIH: R01 AI 21758 (P.T.) and F32 AI 10428 (K.A.B.). We thank members of the Traktman lab for helpful discussions and critical reading of the manuscript; special thanks to Jeremy Nichols for sharing mVRK1 reagents. We also acknowledge B. Bianca and R. Bernard for technical assistance. REFERENCES 1. Barcia, R., S. Lopez-Borges, F. M. Vega, and P. A. Lazo. 2002. Kinetic properties of p53 phosphorylation by the human vaccinia-related kinase 1. Arch. Biochem. Biophys. 399:1–5. 2. Beaud, G., and R. Beaud. 1997. Preferential virosomal location of underphosphorylated H5R protein synthesized in vaccinia virus-infected cells. J. Gen. Virol. 78:3297–3302. J. VIROL. 3. Beaud, G., and R. Beaud. 2000. Temperature-dependent phosphorylation state of the H5R protein synthesised at the early stage of infection in cells infected with vaccinia virus ts mutants of the B1R and F10L protein kinases. Intervirology 43:67–70. 4. Beaud, G., R. Beaud, and D. P. Leader. 1995. Vaccinia virus gene H5R encodes a protein that is phosphorylated by the multisubstrate vaccinia virus B1R protein kinase. J. Virol. 69:1819–1826. 5. Black, E. P., N. Moussatche, and R. C. Condit. 1998. Characterization of the interactions among vaccinia virus transcription factors G2R, A18R, and H5R. Virology 245:313–322. 6. Challberg, M. D., and P. T. Englund. 1979. Purification and properties of the deoxyribonucleic acid polymerase induced by vaccinia virus. J. Biol. Chem. 254:7812–7819. 7. Challberg, M. D., and P. T. Englund. 1979. The effect of template secondary structure on vaccinia DNA polymerase. J. Biol. Chem. 254:7820–7826. 8. DeMasi, J., and P. Traktman. 2000. Clustered charge-to-alanine mutagenesis of the vaccinia virus H5 gene: isolation of a dominant, temperaturesensitive mutant with a profound defect in morphogenesis. J. Virol. 74:2393– 2405. 9. Domi, A., and G. Beaud. 2000. The punctate sites of accumulation of vaccinia virus early proteins are precursors of sites of viral DNA synthesis. J. Gen. Virol. 81:1231–1235. 10. Evans, E., N. Klemperer, R. Ghosh, and P. Traktman. 1995. The vaccinia virus D5 protein, which is required for DNA replication, is a nucleic acidindependent nucleoside triphosphatase. J. Virol. 69:5353–5361. 11. Evans, E., and P. Traktman. 1987. Molecular genetic analysis of a vaccinia virus gene with an essential role in DNA replication. J. Virol. 61:3152–3162. 12. Grimley, P. M., E. N. Rosenblum, S. J. Mims, and B. Moss. 1970. Interruption by Rifampin of an early stage in vaccinia virus morphogenesis: accumulation of membranes which are precursors of virus envelopes. J. Virol. 6:519– 533. 13. Gross, S. D., and R. A. Anderson. 1998. Casein kinase I: spatial organization and positioning of a multifunctional protein kinase family. Cell. Signal. 10:699–711. 14. Hanks, S. K., and T. Hunter. 1995. 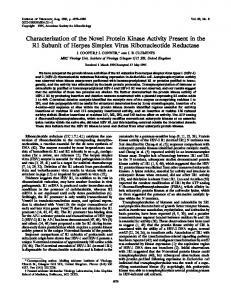 Protein kinases 6. The eukaryotic protein kinase superfamily: kinase (catalytic) domain structure and classification. FASEB J. 9:576–596. 15. Hanks, S. K., A. M. Quinn, and T. Hunter. 1988. The protein kinase family: conserved features and deduced phylogeny of the catalytic domains. Science 241:42–52. 16. Hoekstra, M. F., R. M. Liskay, A. C. Ou, A. J. DeMaggio, D. G. Burbee, and F. Heffron. 1991. HRR25, a putative protein kinase from budding yeast: association with repair of damaged DNA. Science 253:1031–1034. 17. Ishii, K., and B. Moss. 2001. Role of vaccinia virus A20R protein in DNA replication: construction and characterization of temperature-sensitive mutants. J. Virol. 75:1656–1663. 18. Klemperer, N., W. McDonald, K. Boyle, B. Unger, and P. Traktman. 2001. The A20R protein is a stoichiometric component of the processive form of vaccinia virus DNA polymerase. J. Virol. 75:12298–12307. 19. Koerner, T. J., J. E. Hill, A. M. Myers, and A. Tzagoloff. 1991. Highexpression vectors with multiple cloning sites for construction of trpE fusion genes: pATH vectors. Methods Enzymol. 194:477–490. 20. Kovacs, G. R., and B. Moss. 1996. The vaccinia virus H5R gene encodes late gene transcription factor 4: purification, cloning, and overexpression. J. Virol. 70:6796–6802. 21. Kovacs, G. R., N. Vasilakis, and B. Moss. 2001. Regulation of viral intermediate gene expression by the vaccinia virus B1 protein kinase. J. Virol. 75:4048–4055. 22. Liu, K., B. Lemon, and P. Traktman. 1995. The dual-specificity phosphatase encoded by vaccinia virus, VH1, is essential for viral transcription in vivo and in vitro. J. Virol. 69:7823–7834. 23. Lopez-Borges, S., and P. A. Lazo. 2000. The human vaccinia-related kinase 1 (VRK1) phosphorylates threonine-18 within the mdm-2 binding site of the p53 tumour suppressor protein. Oncogene 19:3656–3664. 24. McCraith, S., T. Holtzman, B. Moss, and S. Fields. 2000. Genome-wide analysis of vaccinia virus protein-protein interactions. Proc. Natl. Acad. Sci. USA 97:4879–4884. 25. McDonald, W. F., V. Crozel-Goudot, and P. Traktman. 1992. Transient expression of the vaccinia virus DNA polymerase is an intrinsic feature of the early phase of infection and is unlinked to DNA replication and late gene expression. J. Virol. 66:534–547. 26. McDonald, W. F., N. Klemperer, and P. Traktman. 1997. Characterization of a processive form of the vaccinia virus DNA polymerase. Virology 234:168– 175. 27. McDonald, W. F., and P. Traktman. 1994. Overexpression and purification of the vaccinia virus DNA polymerase. Protein Expr. Purif. 5:409–421. 28. McDonald, W. F., and P. Traktman. 1994. Vaccinia virus DNA polymerase. In vitro analysis of parameters affecting processivity. J. Biol. Chem. 269: 31190–31197. 29. Nezu, J., A. Oku, M. H. Jones, and M. Shimane. 1997. Identification of two novel human putative serine/threonine kinases, VRK1 and VRK2, with structural similarity to vaccinia virus B1R kinase. Genomics 45:327–331. virus mutant which encodes a phosphonoacetic acid-resistant, temperaturesensitive DNA polymerase. Virology 128:444–457. Stuart, D. T., C. Upton, M. A. Higman, E. G. Niles, and G. McFadden. 1993. A poxvirus-encoded uracil DNA glycosylase is essential for virus viability. J. Virol. 67:2503–2512. Taddie, J. A., and P. Traktman. 1991. Genetic characterization of the vaccinia virus DNA polymerase: identification of point mutations conferring altered drug sensitivities and reduced fidelity. J. Virol. 65:869–879. Taddie, J. A., and P. Traktman. 1993. Genetic characterization of the vaccinia virus DNA polymerase: cytosine arabinoside resistance requires a variable lesion conferring phosphonoacetate resistance in conjunction with an invariant mutation localized to the 3⬘-5⬘ exonuclease domain. J. Virol. 67: 4323–4336. Tartaglia, J., A. Piccini, and E. Paoletti. 1986. Vaccinia virus rifampicinresistance locus specifies a late 63,000 Da gene product. Virology 150:45–54. Traktman, P., M. K. Anderson, and R. E. Rempel. 1989. Vaccinia virus encodes an essential gene with strong homology to protein kinases. J. Biol. Chem. 264:21458–21461. Traktman, P., M. Kelvin, and S. Pacheco. 1989. Molecular genetic analysis of vaccinia virus DNA polymerase mutants. J. Virol. 63:841–846. Traktman, P., K. Liu, J. DeMasi, R. Rollins, S. Jesty, and B. Unger. 2000. Elucidating the essential role of the A14 phosphoprotein in vaccinia virus morphogenesis: construction and characterization of a tetracycline-inducible recombinant. J. Virol. 74:3682–3695. Vega, F. M., P. Gonzalo, M. L. Gaspar, and P. A. Lazo. 2003. Expression of the VRK (vaccinia-related kinase) gene family of p53 regulators in murine hematopoietic development. FEBS Lett. 544:176–180. Zelko, I., R. Kobayashi, P. Honkakoski, and M. Negishi. 1998. Molecular cloning and characterization of a novel nuclear protein kinase in mice. Arch. Biochem. Biophys. 352:31–36. 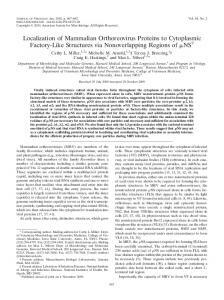 Report "Members of a Novel Family of Mammalian Protein ... - Journal of Virology"